A most mysterious package appeared at my doorstep when I got home this evening. The box was heavy and upon opening it, I was totally taken aback by surprise at the content. It was packed full of nothing but useless Sandtrooper cards. Yes all 5000 of them! it’s really packed just like that? send them all to me!!! wow that’s a lot of cards. I’d take a couple off your hands. not laminated but glossy finish like trading cards. fresh from post office more like it. flew all the way from the US. Sell them off eBay! Someone would be sure to buy them! Apparently, the guy who started off with a red paper clip managed to land himself a house. Or, you could just send your card to a random blogger or The Daily WTF. looks expensive for toilet paper ^^;;;! 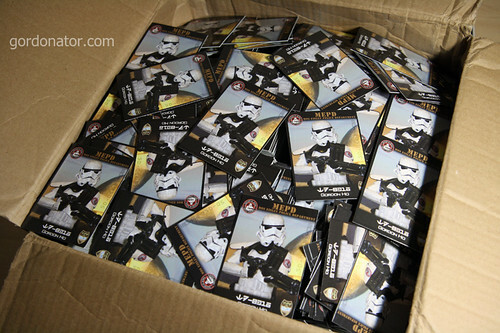 Boy oh Boy they packed them quite bad eh?Noticed any dents or similar on the cards? Build me a landspeeder of cards.